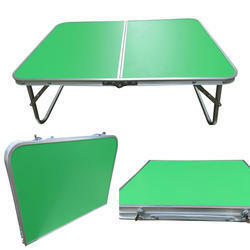 Our range of products include variable height table- coffee, folding aluminium laptop table baby table- green, folding aluminium laptop table baby table- blue, stacking plastic stool, stacking chair- blue, folding table-6'x2.5' and folding table - 150x75 cm- split top. Dimensions :Open Size 182 x 75 x 73 Cm Height. Weight - 15 Kg. 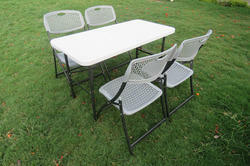 Suitable for Garden, Restaurant, Food Parlor, Cafeteria, Canteen, Farm House Etc. 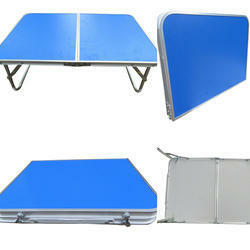 Dimensions : 150 x 75 x 37 Cm & 74 Cm Height. Weight - 15 Kg. Can achieve 2 Heights - 37 Cm and 74 Cm. 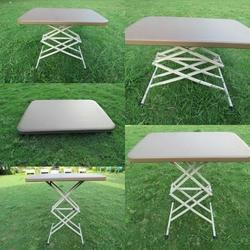 Folding Garden Table made of blow molded virgin plastic top and powder coated M.S. 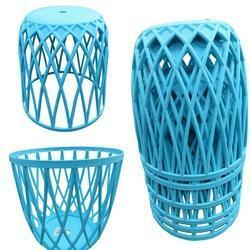 round tubular frame is very sturdy and user friendly product. Can be folded and carried using its belt as a bag. Material Used: Blow Molded Virgin H.D.P.E. (High Density Polyethylene) top M.S. Powder coated Tubular Frame Key Features: Can be folded and unfolded in seconds Can be carried anywhere in a car Size: Table Top: 150 Cms x 75 x 37 Cm & 74 Cm Height. Size 122 x 60 x 74 Cm Ht. 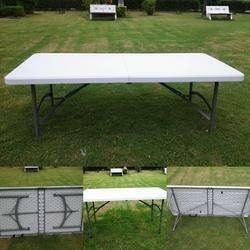 Strong, stable and all weather proof design offers usage in open like garden,farm house, terrace, picnicking etc. 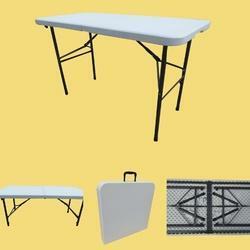 Perfectly suitable for food parlors, Ice cream parlors, Canteens, Banquets etc. SPECIAL INSTRUCTIONS : Return of this product is not accepted by the seller unless it is found defective by the buyer while taking delivery and/or if the product is not as per its description website. Such discrepancy is to be reported along with proof of the same within 24 Hrs. after delivery of the product . Size 152 x 75 x 74 Cm Height. Dimensions : 152 x 75 x 74 Cm Height. Weight : 15 Kg. 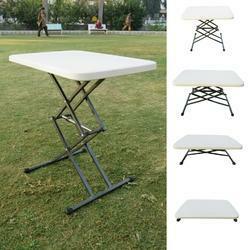 Best suitable for Gardens, Open restaurant, food parlors, farm house, canteen, cafeteria etc. 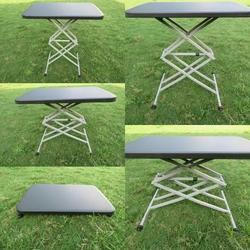 Folding Garden Table made of blow molded virgin plastic top and powder coated M.S. round tubular frame is very sturdy and user friendly product. Can be folded and carried using its belt as a bag. Blow Molded Virgin H.D.P.E. (High Density Polyethylene) top.